That neatly sums up the intent behind the decision to merge relatively strong banks such as Bank of Baroda and Vijaya Bank with the struggling Dena Bank. The presentation made by secretary for financial services showed that the combined entity will have a balance sheet size of over ₹ 14 trillion powered by a network of 9489 branches. It will be the third largest Indian lender. 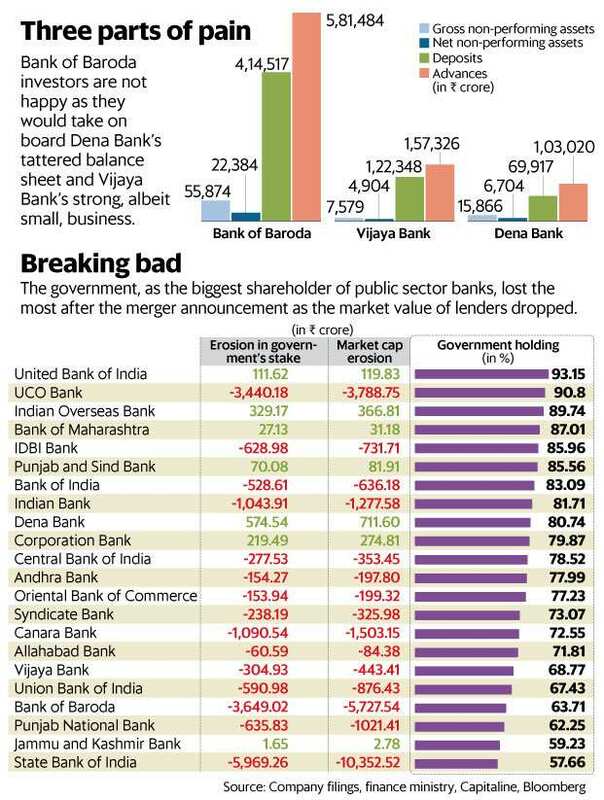 The government is hoping that Bank of Baroda’s large balance sheet and healthy capital ratios and Vijaya Bank’s robust capital base would fill the holes in Dena Bank’s tattered books. The saving grace is that Dena Bank is much smaller than Bank of Baroda, and Vijaya Bank is the strongest of the three. That means the overall capital adequacy ratios, or the NPA ratios, will worsen, but not by much, for BoB. Indeed, the merger is being hailed as positive in the long term by banking experts. For investors in Bank of Baroda, that is cold comfort. They have pored over balance sheets, talked to experts, studied research reports and then decided to put their money in Bank of Baroda, believing that it is one of the better-run public sector banks. And now suddenly, out of the blue, the government announces that because Bank of Baroda is doing well, the additional burden of carrying Dena Bank’s bad loans will be foisted on it. The talk of the PSU bank boards deciding on the merger is of course hot air----they will do what the government wants them to do. In short, the message the government is sending is that if you run your bank well, you will have to bail out weak banks. On the other hand, if you run your bank into the ground, don’t worry, you will be bailed out by a strong bank. Investors in good PSU banks will now have to factor in merger risk in their computations. No wonder private sector banks get better valuations—they are not exposed to North Block risk. Dena Bank has been barred from lending for the past four months by the Reserve Bank of India (RBI). In all respects, it is as valuable as its deposit franchise. What the merged entity will have is Dena Bank’s ₹ 15900 crore toxic loan pile for which provisioning cover is just 58% and a 13,440 strong workforce that in some way or the other contributed to this mess. In other words, not only do Bank of Baroda’s investors get Dena Bank’s bad loans, they also get to keep the people who drove the bank into the ground too. The Finance Minister has assured everybody nobody will lose his job because of the merger. Integration risk looms large over the merger. Broking house Jefferies says many branches of these banks operate in the same neighbourhoods. Will they be able to shut down branches? If so, where will the staff be deployed? What’s more, these banks have very different cultures, different operating procedures, different HR processes. Managing their integration is going to be a Herculean task and we have yet to find a Hercules among PSU bank managers. Even SBI’s merger with its associate banks was a tough task, despite the banks being part of the same family. Perhaps most importantly, if size is all that matters to make a bank strong, why is Punjab National Bank mired in all kinds of trouble? Before going in for such quick fix solutions, the government would have done well to consider the remarks about reforming PSU banks made by RBI ex-governor Raghuram Rajan to the parliamentary estimates committee. Rajan pointed out that public sector bankers continued financing promoters even while private sector banks were getting out, suggesting their monitoring of promoter and project health was inadequate; that the size of frauds in public sector banks has been increasing; that risk management processes still need substantial improvement in PSBs; compliance is still not adequate, and cyber risk needs greater attention.